Trend-setting Sofia 2 is full of ideas – the perfect friend for all of your embroidery and sewing projects. Compact in size, she always has something to share, like 70 built-in embroidery designs and 168 stitches. With a 4″ X 4″ embroidery field, convenient LCD Touch Screen and a USB slot for transferring designs through your thumb-drive, you can create all of your ideas with Sofia. 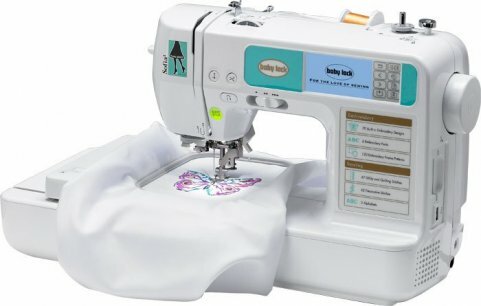 This versatile sewing and embroidery machine also includes plenty of convenient options like an advanced needle threader, automatic thread-cutter and a Quick-Set, top-loading bobbin. No matter what you love to create, Sofia 2 is ready to inspire you. USB (Type A)Transfer your embroidery designs to your machine faster with the USB (Type A) port.